Getting a new phone is exciting at first but then it can become tedious trying to configure everything. Access to the many new features and a faster device is great, but the process of transferring to the new phone is much less rewarding. Remembering every password and user id you rarely use is often frustrating. This is especially true when the phone has not been backed up in some time. Luckily, there is an easier way to move to a new iPhone. 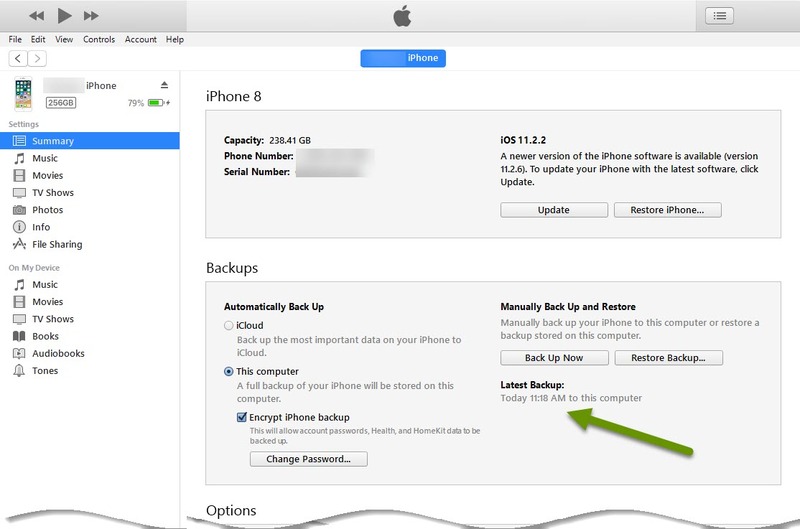 To move to a new iPhone more quickly and without any hassle, use encrypted backups. Encrypted backups store passwords while still protecting the security of your data which allows this information to be restored to a new phone. Email - should work on all accounts no matter how many email accounts are connected to the phone. Wireless settings - saves the wireless info for wireless networks that were successfully connected to already. Third-party applications - most third-party applications that require a password but allow it to be stored will be saved. This typically includes travel, gaming or social media apps. NOTE: Not all applications will restore passwords. Apps that always prompt for credentials, like banking applications, will still require login credentials. To be able to transition to a new phone by restoring from the existing phone, you must have a working phone. This phone will create the encrypted backup which can then be restored onto the new iPhone. Connect the old phone to a device with iTunes installed. Click on the phone icon to access its settings. 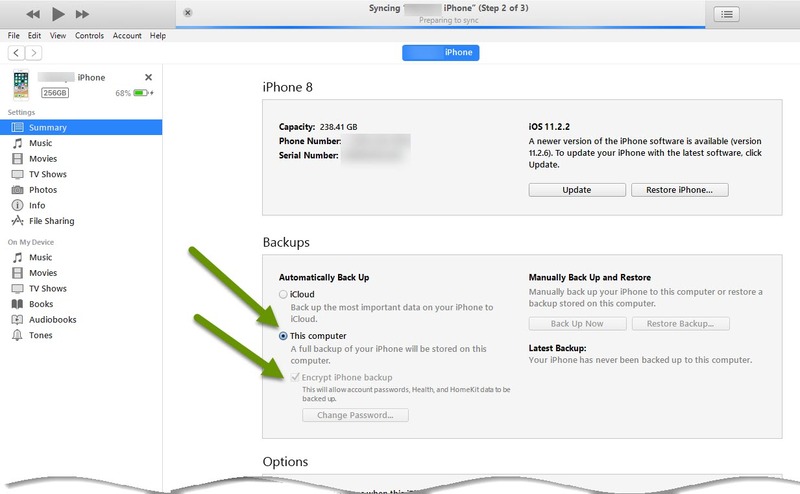 In the middle of the page under the Backups heading, click the radio button next to "This computer" and check the box to "Encrypt iPhone backup" if it is not already enabled. This will prompt you to create a password for the encrypted backup if this has not already been done. Running subsequent backups will not require this password as it is only needed to set up the encrypted backups and when restoring from an encrypted backup. Once the backup finishes, check the same section under the heading "Latest Backup:" to verify the date and time of the backup are correct. 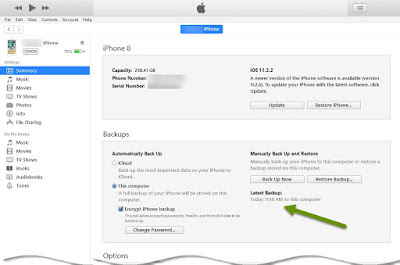 Connect the new iPhone to the device where the encrypted backup is located. 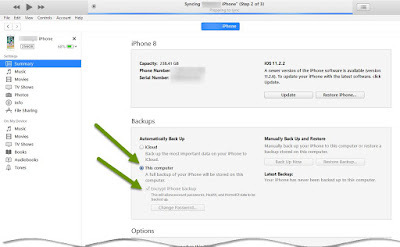 When prompted, select to restore the new phone from an existing backup rather than creating a new device. Once you select this option, you will be prompted to enter the encrypted backup password. This is the password set when creating the encrypted backup which may differ from your iTunes password. After the password has been entered the new phone will begin the restore process. Getting a new phone is exciting. The best way to prevent the excitement from being turned into frustration is to prevent the need to re-enter passwords. Instead, use the built-in iTunes feature to create an encrypted backup. This type of backup can be restored onto the new phone and avoids the hassle of entering credentials for every email or third-party application. Also, by storing the data in an encrypted state, you never have to worry about the information stored in the backup being compromised. As always, easier is better, but when easier also comes with better security it is the only way to go!